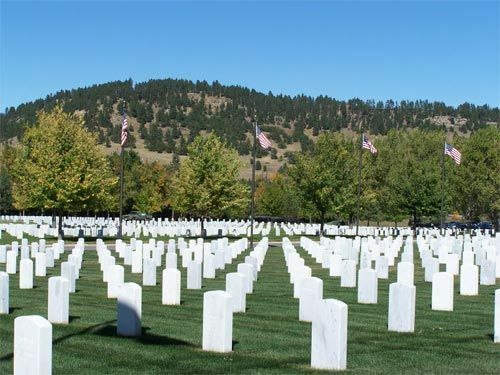 WASHINGTON — The U.S. Department of Veterans Affairs’ (VA) National Cemetery Administration announced today that it has acquired 181.32 acres of land near Sturgis, South Dakota, to expand Black Hills National Cemetery. The Bureau of Land Management, an agency within the Department of the Interior, transferred the land to VA in accordance with Public Law 115-175, the Black Hills National Cemetery Boundary Expansion Act. The law was signed by President Trump on May 25, 2018. Before the expansion, Black Hills National Cemetery consisted of 105.90 acres of land, 96% of which had already been developed. More than 29,000 Veterans, spouses and eligible family members are interred there. The additional land will serve the projected interment needs of Veterans in western South Dakota for the next 100 years after the current space is depleted. V-A operates 136 national cemeteries and 33 soldiers’ lots and monument sites in 40 states and Puerto Rico. For Veterans not buried in a VA national cemetery, VA provides headstones, markers or medallions to commemorate their service. Information on VA burial benefits is available from local VA national cemetery offices, online at https://www.va.gov/burials-memorials/ or by calling VA regional offices toll-free at 800-827-1000.